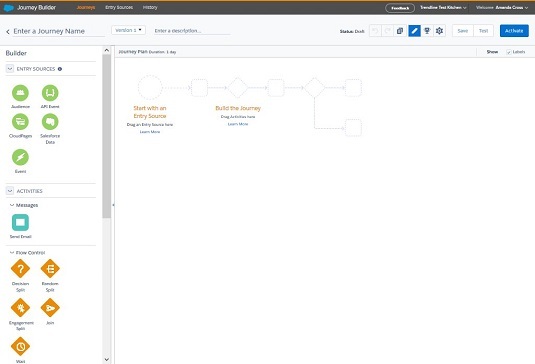 To create a journey in Salesforce Marketing Cloud, click the New Journey button on the right side of the screen. The journey canvas appears. Enter the journey name and optional description at the top of this screen. The journey canvas where you create a new journey. The primary action you take on the journey canvas is dragging entry sources or activities from the Builder on the left side of the screen to where you want them to appear in the flow of the journey on the right side of the screen. After you have the entry source in the place you want, you click the entry source or the activity on the right side of the screen to configure it. Near the top of the screen, between the name and description, is a version indicator. If a journey has multiple versions, you can click the down arrow next to the version number and choose which version you want to view. Journey Builder freezes a version of the journey when it becomes active — because you clicked the Activate button or because the scheduled activation time has arrived. When you create a journey, the version indicator says Version 1. After Version 1 is active, you can’t change the decision points, wait times, or other activities of the journey without creating another version. You can update email send activities to, for example, swap in different images or update the subject lines without having to publish a new version of the journey. The option to create a new draft appears on active journeys. Click this option to create a copy of the journey as Version 2. You can make changes to this draft version, and then activate the new version or schedule it to become active later. After the new version becomes active, all new contacts entering the journey would start Version 2. Version 1 continues running for the contacts who had already begun the journey. Version 1 appears with the status of Finishing. When you’re sure that all contacts in Version 1 have exited the journey, you can stop it. The next time you want to make updates to the journey, you create another draft (Version 3) and continue to iterate in this fashion. It’s possible to stop the current version of a journey without having a new draft version activated or to stop all versions of a journey at the same time. This isn’t recommended unless it’s an emergency. In both cases, all contacts in the journey would immediately exit, which could result in a poor experience for your customers. Undo button: Undo the most recent action you performed. For example, click this button to retrieve an activity that you accidentally deleted. Redo button: Redo the action that you undid with the undo button. You can’t click this button until you’ve clicked the undo button at least once. Copy button: Create a draft copy of the entire journey. If you click this button, a window appears where you type a new name and description for the copy of the journey. Note: You might expect this button to create a copy of an individual activity, but it creates a copy of the entire journey. Delete button (trash can): Delete the journey or the version of the journey. Like the copy button, the delete button doesn’t delete individual activities. If you want to delete the entry source or an activity from the journey, pause your mouse pointer over the thing you want to delete. A window appears that contains a trash can icon. Click that icon to delete the item. Goals provide a quick, visual way to see whether the subscribers who are passing through a journey are meeting your marketing objective for the journey. You set a goal for a journey by clicking the trophy button above the canvas. When you set up a goal, you choose a data extension field and set the value that you want that field to contain. As Journey Builder finds subscribers whose data extension field matches the value you set, it updates the percentage of the whole that has met the goal. 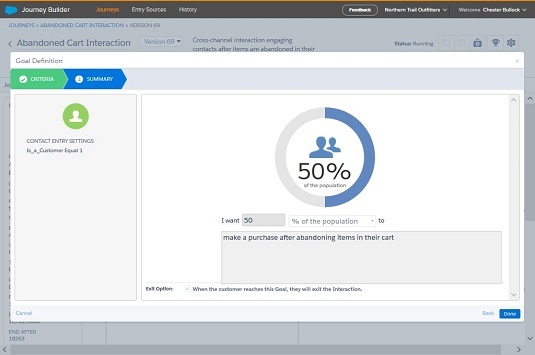 For example, you could create a goal of 50 percent of people who abandon their carts then going on to make a purchase. Journey Builder will update the statistics to show the goal as met. This journey has a goal of getting people who left items in their online shopping cart to finish the transaction. Setting a goal is optional. If you set a goal, you can also configure the journey so that subscribers exit the journey as soon as they meet the goal. You can choose a data extension field as your goal field only if you have defined the data extension as a contact data type of data extension. To do this, include it in an attribute group defined in the Contact Builder app. If you haven’t included the data extension that you want to use in an attribute group, you won’t be able to choose the fields from that data extension from the drop-down menu when you define the goal criteria. After you choose the data extension, field, and field value, you set the number of people or percentage of people that you want to meet that goal. Journey Builder uses this information to determine which journeys are the most successful. The next button above the canvas has the gear icon. Click this button to open the journey settings. No re-entry: Choose this value if a subscriber can enter this journey only once. Re-entry anytime: Choose this value if a subscriber can enter this journey multiple times, even if he or she hasn’t exited it. Re-entry only after existing: Choose this value if a subscriber can re-enter the journey, but only after the subscriber has finished it. The other setting you can manage is Default Channel Addresses. As of the time of this writing, this setting was slated to be deprecated; if you still see it, you should probably just leave it set to the default value. When you’ve finished managing the settings for the journey, click the Done button to return to the journey canvas. The last items on the toolbar are the Save, Test, and Activate buttons. Save button: Save the draft version of the journey that you’re working on. Journey Builder does not automatically save as you make changes, so make sure to save often, especially if you are building a complex journey. Test button: Verify that all paths in the journey are set up correctly. The system checks that you have configured the filters for all split activities and associated all message activities with messages. Activate button: Set the current draft version of the journey to active, meaning that all new contacts entering the journey will flow into that active version of the journey. It’s highly recommended that you perform a begin-to-end test with the journey set to active to verify that sends are working as expected. You should set up special testing contacts and email addresses for this purpose. If necessary to facilitate testing, you can reduce the wait periods to minutes instead of hours or days. After you’ve completed the testing and verified that it’s working as you expected, you could create a new draft version with the correct wait times. Make sure to set that version to active before allowing your audience to begin to flow into the journey.